At Harris Academy Rainham we are very interested in language. We work hard to help students become confident, articulate and thoughtful in their appreciation of the English language, because excellent literacy skills are vital for our students' future education, employment and all round well-being. To discuss how best to help your son or daughter with reading and vocabulary at home, please contact Mrs H Cohen, Literacy Lead (h.cohen@harrisrainham.org.uk), or Mr T Street, Vice Principal (t.street@harrisrainham.org.uk). To help students choose entertaining books that will help their literacy levels we've compiled the ‘Rainham 100’ - one hundred books that the staff, students and parents believe to be classics and that students should aim to read during their time at the academy. Download the Rainham 100 list of books. Which one will you read next? Here are just some of the ways we support reading and literacy. All students in years 7-10 are expected bring an appropriate and challenging reading book to the academy every day. This book is used and discussed in their English lessons, for example, and during learning guidance. Students at Harris Academy Rainham have more hours of English teaching each week than the national average. We offer specialist intervention and phonics programmes. Subject teachers explain the etymology of words in lessons (see below) – helping students understand the root word or base terms of subject-specific vocabulary. See example below. During learning guidance time, teachers introduce new tier 2 and tier 3 vocabulary as well as recap on words previously used by teachers. We promote an interest in etymology through various library competitions and other incentives to learn key root terms. 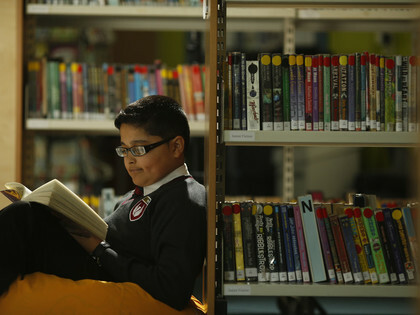 Students’ reading ages are regularly tested to ensure they leave the academy reading confidently and at a high level. We build key terms, phrases and subject-specific vocabulary into our curriculum in order to ensure students are prepared for KS4 examinations and beyond. We use 'Bedrock Vocabulary' across the academy – an online platform that builds students' understanding and range of words. Numerous studies show that reading for pleasure makes a big difference to children’s educational performance. Evidence suggests that children who read for enjoyment every day not only perform better in reading tests than those who don’t, but also develop a broader vocabulary, increased general knowledge and a better understanding of other cultures. We teach etymology across all our subjects. Etymology explores the history and development of individual words. It answers the question: "where did this word come from?" You've probably encountered etymologies when someone explained the meaning of a word, or when you sought out the origin of a word. Etymology requires an understanding of the parts of words – their pronunciation and grammar components. Etymology is also a diachronic process. In other words, etymology is a function of a language's change over time. This includes awareness of some key concepts like cognates and borrowings, reconstruction of proto-languages, and discussions about the difference between ‘lects’ (languages, dialects, idiolects). A really important and widely used Latin root word is port, which means ‘carry’ or ‘to carry’. Humans ‘carry’ things from one place to another all the time. Portly humans, for instance, ‘carry’ a lot of weight or fat. When one nation imports goods from another nation, it ‘carries’ them into its own area. On the other hand, to export goods is to ‘carry’ them out of one country to trade with another. Most of these products are portable, or easily ‘carried’ from one country to the next. Human beings can also be deported from their own countries, being ‘carried’ from one nation to another. When something is said to be important, you want to ‘carry’ it forward. Reporters ‘carry’ back information to the public at large, often focusing on important concerns. Sometimes reporters talk about sports, for example, which is an entertainment that ‘carries’ you away from everyday type of activities. Transportation, or the act of ‘carrying’ people across from one place to another, forms the basis of much of everyday life. Cars support or ‘carry’ us as we travel around. An even faster way to get from one place to another is via teleportation, or the ability to be ‘carried’ instantaneously from one place to another. Have you ever had a porter, or one who ‘carries’ luggage, help you at a hotel you are staying at? A portfolio is also a case in which you can ‘carry’ items, such as works of art, work documents or photographs; a portfolio also refers to the items put in the portable case. Import 'port' into your brain, and it will ‘carry’ you far with knowledge of words! Here are some useful links and documents that support our work within the Academy. To discuss how best to help your son or daughter at home, please contact Mrs H Cohen, Literacy Lead (h.cohen@harrisrainham.org.uk) or Mr T Street, Vice Principal (t.street@harrisrainham.org.uk).